Rep. Nancy Pelosi (D-CA) says that a ‘glass of water’ could be elected in Rep. Alexandria Ocasio-Cortez’s (D-NY) district if it ran as a Democrat. The House Speaker seemed to downplay the young congresswoman’s success in toppling longtime incumbent Joe Crowley in what was regarded by many as one of the biggest upsets in the 2018 midterm elections. 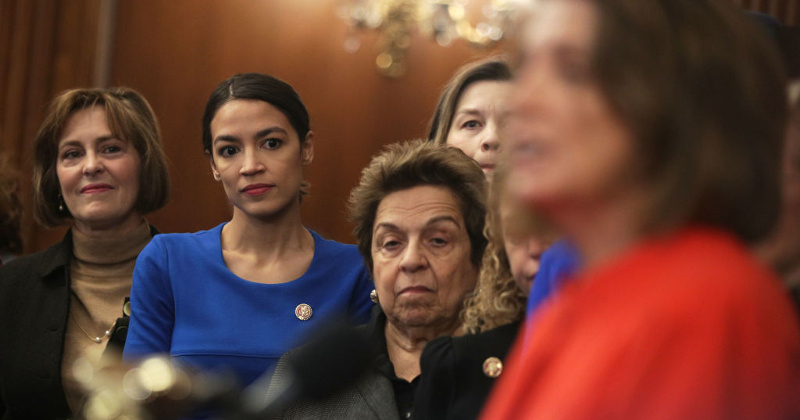 Pelosi clarified that she didn’t mean to “diminish” the “exuberance and personality” of Ocasio-Cortez and her contemporaries, such as Rep. Ilhan Omar (D-MN) and Rep. Rashida Tlaib (D-MI) — all first-term congresswomen who represent an insurgency of radical socialists within the party. Pelosi’s remarks came immediately following an interview with 60 Minutes in which she rejected the young revolutionaries as a threat to her power. “You have these wings — AOC and her group on one side…” said host Lesley Stahl, in reference to new factions forming in the Democrat Party. Watch as the Democrats and MSM talking heads go into a death spiral now that they know their game is up. House Speaker Nancy Pelosi (D-Calif.) rejected the notion of impeaching President Trump for overly political reasons. Of course, that’s not to say Democrats won’t impeach the president if they can get several Republicans to go along with it, but Pelosi is setting a high standard regardless. [Trump’s] been a great organizer for Democrats, a great fundraiser for Democrats and a great mobilizer at the grass-roots level for Democrats. [Laughs.] And I think that’s good for America. Some may also suggest that Pelosi doesn’t expect the upcoming Mueller report to contain enough substance for impeachment proceedings. Will our humanity survive if cyborgs become a commonplace reality?